Alas, the team named for a bird fell short of the crown in Super Bowl XLIX. While many human beings felt anguish and rage at the loss, most avifauna appeared unperturbed. The non-Seahawk birds that caught my eye this weekend were Northern Cardinals, which always look their best burning crimson against a blanket of white snow. 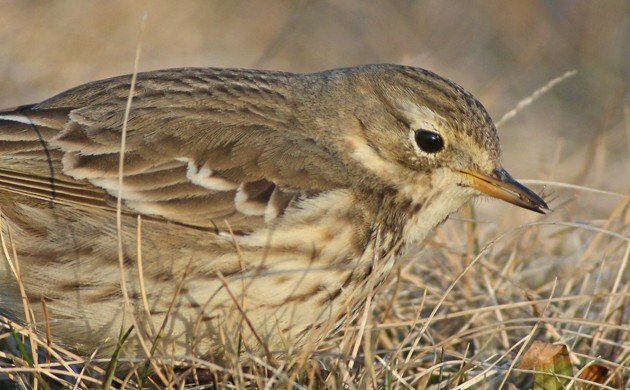 Corey’s Best Bird of the Weekend was a wonderful American Pipit foraging on the roadside margin at Jones Beach State Park. Corey was amazed at the sheer number of bugs and other creatures that the pipit found to eat. A foraging Superb Lyrebird going through his repertoire at the same time! A long-awaited lifer Lapland Longspur south of Ottawa, Ontario! Four Lapland Longspurs in Orange County NY! The field sparrow at our feeders may have been the first we’ve seen in the yard. Looking forward mightily to spring…. A lovely pair of Barrow’s Goldeneyes swimming about at the local marina here on the Olympic Peninsula. Iceland Gull and Northern Saw-whet Owl were two of the many lifers I got at the Outer Banks! Western Kingbird in Mandeville, LA! Killer looks at and photos of Lanceolated Monklet at Quebrada Gonzalez, Costa Rica. I have looked for this species at this site for more than ten years, none seen or heard until Saturday! Tropical birding is always chock full of surprises. Loving all the birds from around the world that people are seeing! Congrats on the Lanceolated Monklet, Pat! A Red-necked Grebe (my first) in Rockaway Inlet, Brooklyn, NY. I know they were all over the New York area last year, but somehow missed them all! So this was very special.